We have many historical re-enactors or living historians where I live. Our neighboring battlefields and monuments need context to understand what happened on this land 150 years ago and more. Just to the north of where I live is a park dedicated to the Cherokee nation and the beginning of the Trail of Tears. A few miles down the road is a national battlefield where the Confederate army won a major battle just before losing a bigger one. What is the draw and the danger of re-enacting portions of history? It isn’t only recreational. Craftspeople specialize in creating historical replicas, like the armour that was used in the Marathon re-enactment. Experimental archaeologists test specific hypotheses about aspects of history as a form of academic inquiry. Inevitably, some guesswork is involved; recreating the past means you have to fill in a lot of little gaps in the historical record. . . . I learned by way of our own Phil Wade that Bethany House has made J. Mark Bertrand’s novel Back on Murder (which we both reviewed very favorably, here and here) free in Kindle form for a limited time. We’re Bertrand boosters around here, and this book has the coveted Brandywine Books imprimatur. When I built the chest, I made the decision to use leather handles, for two reasons. One, it’s cheaper than getting period iron ones, and I cheated on all the hardware on that project. But also I’ve seen an old immigrant trunk from one of our ancestors that came over from Norway with leather handles, and I always thought that was kind of cool. Easy on the hands. (Except not really. The flexible handles tend to squeeze your fingers when the chest is heavy, which this one is). The very handle you behold in that photograph broke on me a little while back, and I dreaded the process of replacing it. But I took it on today, replacing it with a sturdy piece of belt blank I acquired a while back for tooling and never got around to using. It came out well. Also I mowed the lawn, which was as exciting as you imagine. But the big deal was that I got my official score for the Miller Analogies Test in the mail. After having to take it twice and beating myself up at getting a score of 475 out of a possible 600, I learn now that 475 puts me in the 99th percentile, which even I can’t find a way to disparage. Why anyone would design a test with a 200 to 600 scoring range, where the top 100 points are almost never used, I can’t imagine. No doubt they have their reasons, just as I insist on putting leather handles on chests. Tivoli Fest in Elk Horn, Iowa this year was good. Exhausting, as always, for an old man like me, but good. I have no complaints. I didn’t take any pictures. I took my camera, but did nothing with it. There are plenty of pictures, taken by others, on Facebook, but I myself didn’t see much that was different from last year, so the pictures in my report from a year ago ought to serve adequately. Our first activity was a “Viking wedding.” A couple already married legally (or soon to be married; I didn’t ask) were given a heathen ceremony next to the replica Viking House. I attended out of politeness, and wished them well, and was relieved to learn that the celebration wasn’t going to be so authentic as to require three solid days of drunken feasting. Saturday was well organized. We had group battles (seven men per side) scheduled for 12:30, 3:00 and 6:00. Lots of fun. I think I was left standing once, but only because I’d been (theoretically) badly wounded in the right arm, and so fell back, out of the fight. We had the same Scottish cook as last year, and the food was good, plentiful and (relatively) authentic. Once again there was a haggis—a “beef haggis” (somebody said such things are acceptable in a pinch), and I thought it better than last year’s. The evening was given over to conversation, ranging from the scholarly to the scatological. I had the great pleasure of having a conversation with an Englishman (who bought one of my books). His opinions weren’t at all the sort that I expect from Englishmen nowadays, but maybe that explains why he lives in Iowa now. 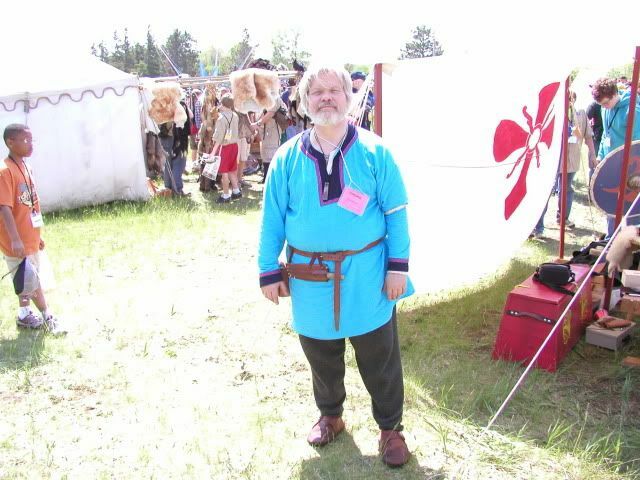 He’d studied history and archaeology, and been a Saxon reenactor, in his homeland, and I like to think I was able to talk to him on something approaching an equal level. He did disappoint me, however, by informing me that my proper Anglo-Saxon pronunciation of the name of the Venerable Bede (Bae-deh) was pretty much a waste of time, because everybody pronounces it “Bead” over there, just like over here (on the rare occasions anyone ever talks about him at all over here). Afterwards, another delightful fireworks display, marred only by the fact that a couple fires started in the launching area. This engendered considerable mirth among us Vikings, and several guys speculated about the fate of “One-eyed Bob and his crew of four-fingered pyrotechnicians” who (they were certain) were in charge of everything. The volunteer fire department came in to douse the fires, but in fact left one of them smoldering, and it flared up again. But then I went to bed, and apparently no disaster followed. Sunday we were incited, by bloody-minded festival organizers, to stand along the edges of the street and harass bicyclists participating in the official festival bike ride. There were no casualties. Later I went up to the fire department to enjoy the all-you-can-eat aebelskiver breakfast (an aebelskiver is a sort of Danish pancake, fried in balls rather than flat. Wonderful eating). I did not taunt the firemen on their shoddy performance the night before. We didn’t do any big battles on Sunday, but the Skjaldborg guys from Omaha gave my group some training in areas in live steel combat where we’d picked up bad habits. It all made sense, and I was grateful for the correction. They also showed us how to fight with an axe, and one of them presented us with our first club fighting (blunt) axe. If anybody from Skjaldborg reads this, much thanks. Tivoli wouldn’t be Tivoli without rain, but the rain that came on Sunday afternoon was pretty light, so we didn’t have to take wet tents home. I drove down and back with a young member of our group, a new fellow, and having company (especially a C.S. Lewis fan) made the journey a whole lot shorter. Still, the dream I had Saturday night, of encountering a skidding, out-of-control semi-trailer truck on the highway, did not come true. I am not a prophet, and all things considered, I’m glad of that.